After a long fight with a degenerative disease, Ruben Navarro appeared close to death. So the hospital caring for him alerted the local transplant network, which rushed a team to the medical center to try to salvage the 25-year-old's organs. But as Navarro hung on, tension mounted in the operating room of Sierra Vista Regional Medical Center in San Luis Obispo, Calif. With time slipping away, one of the transplant surgeons ordered repeated doses of the narcotic morphine and the sedative Ativan, jokingly calling the drugs "candy," according to police reports. Navarro eventually died, but too late for his organs to be useful. Horrified nurses complained, prompting multiple investigations. In July, prosecutors charged Hootan Roozrokh with trying to hasten Navarro's death, marking the first time a surgeon has faced criminal charges in a transplant case. I think John Lott's Freedomnomics may one day be added to the classic literature of libertarianism (with a little "l"). Art is a very well known economist and this is very nice of him. Freedomnomics was excellent, it reinforced my belief in the free market, as both a system that betters the lives of people all over the world, as well as in the United States. Further, it helped convince me beyond most doubt that taxes and government are the antithesis of progress, efficiency, and to a degree, even altruism and mandated by government to look out for government interests, and by its nature will continue to expand. . . . The New York TImes as a reminder of the influence that Ayn Rand's Atlas Shrugged has had. In particular, it mentions how the book has shaped the feelings of many corporate executives. Ann Coulter is shown here promoting Freedomnomics in a talk at Xavier University. Thanks very much to Zeke for sending me this link. The ban comes "nowhere close to disarmament of residents. The District's overwhelming interest in reducing death and injury caused by handguns outweighs respondent's asserted need . . . ." The obvious key here is that DC says people can use rifles and shotguns for self-defense. D.C. also adds that they don't believe that the regulations that lock up and require the disassembling of guns does not "prevent the use of a lawful firearm in self-defense." But locked guns are simply not as readily accessible for defensive gun uses. In the U.S., states that require guns be locked up and unloaded face a 5 percent increase in murder and a 12 percent increase in rapes. Criminals are more likely to attack people in their homes and those attacks are more likely to be successful. Since potentially armed victims deter criminals, storing a gun locked and unloaded actually encourages increased crime. — "All too often, handguns in the heat of anger turn domestic violence into murder." To put it bluntly, criminals are not your typical citizens. Democrats refuse to criticize MoveOn.org's attack ad on General Petraeus. Officials involved in a joint federal-state probe say that some of the dozens of people under investigation in a months-long Bexar County voter fraud case may be charged with both state and federal crimes. Federal investigators are to meet this week with local prosecutors to coordinate the cases being developed and determine who'll face state felony charges for voting illegally and who will be deported for violating federal immigration law. Authorities said they are anticipating charging some of the undocumented people alleged to have voted in Bexar County with felony violation of state law before they are turned over to immigration agents and likely deported. . . . .
Well, so may be it doesn't matter that Canada has a photo ID requirement. Canada's chief electoral officer says he will not bow to the will of a Commons committee, only to the will of Parliament as a whole on the issue of forcing veiled women to bare their faces at polling stations. This comic strip was too sensitive politically for the Washington Post. Apparently the previous week's strip making fun of the deceased Jerry Falwell was not a problem for the newspapers, but this one dealt with Islam. So does this count as a political donation by the NY Times? If Tapper's numbers are correct, MoveOn.org paid just 38.89% of a full-cost, nationwide ad, or a 61.11% discount off of a full-rate ad. While I'm fairly certain that nobody pays "sticker" prices, 61% off seems a rather sweet deal. If this was to a political campaign, would this count towards donation limits? I assume that campaigns take out ads, but does the NY Times charge everyone the same amount for ads. The typed words on the school memo are as direct as they are stunning: "No Deans are permitted to call 911 for any reason." An assistant principal at Jamaica High School wrote the order just two weeks before ninth-grader Mariya Fatima suffered a stroke at the Queens school in April. Employees waited more than an hour before calling 911, according to court records, costing Mariya crucial minutes of medical treatment, a delay that may have made her paralysis worse. A month after Mariya collapsed, the same assistant principal sent out another memo, flip-flopping and telling the deans it was okay to call 911, but instructing them to downplay assaults. The author of the memo and the school's principal have both since left Jamaica High School, but that's little comfort to Mariya's family. "You take it for granted that your child is going to be safe, but if they don't want to call 911, no matter what the circumstances, your child is not protected," family lawyer Gary Carlton said. Mariya, who lost use of her right hand and leg, has had to relearn how to speak and walk since the stroke. She's receiving home instruction, but her reading skills have dropped to a fifth-grade level. "I want to go back [to school]," she recently told the Daily News. "I feel lonely." The memos, obtained by The News, shed light on the lengths some educators will go in order to improve crime statistics and avoid harsh penalties. Mattel Inc. CEO Robert Eckert pledged Wednesday to work to improve toy safety, and insisted that the company acted responsibly in recalling millions of Chinese-made toys because they contained lead paint or small magnets. Seeking to tamp down public outrage over a rash of recalls, Eckert acknowledged his El Segundo, Calif.-based company made mistakes by not closely overseeing subcontractors in China whose toys didn't meet U.S. safety standards. But he steadfastly disputed reports that Mattel was feuding with federal regulators over warning requirements and as a result didn't disclose quickly enough dangers of excessive lead paint and small magnets in toys that prompted an Aug. 14 recall of 19 million products worldwide. "We are by no means perfect," Eckert said in prepared testimony to a Senate Appropriations subcommittee. "But we have tackled difficult issues before and demonstrated an ability to make change for the better, not only within our own company but for the broader industry." . . . .
An update on the decision by public universities in Iowa on whether campus police should be allowed to carry guns is available here. 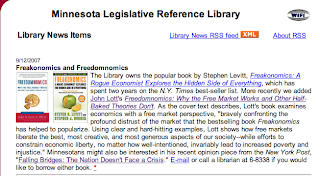 A direct link to the Minnesota Legislative Reference Library is available here. "Man In Wheelchair Shoots Intruder"
DETROIT -- A wheelchair-bound man shot an intruder in his home in the 8100 block of Alpine Road in Detroit Sunday night. The man said he saw the intruder as he was getting out of the shower. The homeowner told police he shot the man to protect his home and he feared for his life. Why a free-market wage is a "fair wage"
As a general rule, free market wages are the height of fairness. A free-market wage is the wage that a person gets in a competitive sector of the economy. Generally, this reflects the degree to a worker contributes to lives of other people. This is because a worker’s salary reflects the degree to which others value his goods or services and the degree to which others value his goods and services reflects the degree to which these things make their lives go better. As Walter Williams has pointed out, such a system in effect rewards persons on the basis of what they’ve done for their fellow man. . . . Yesterday, two members of Code Pink stood up and yelled during General David Petraeus testified. These two women were dressed all in pink. The same thing happened on Tuesday. It looked like the same two women. I thought that Ike Skelton had promised on Monday that these two women would be prosecuted to the full extent of the law. Whatever penalty these two women faced, how is it that these two women got into the hearing. It is my understanding that the audience had to get passes to attend the hearing. Why were these two women allowed in? Why did the Democrats want them to attend? Why does the press ask the Democrats why they keep letting these women in the hearing rooms? It is being called the Thompson bounce, but it does not seem to have started fading. In the race for the Republican Presidential Nomination, Thompson is now the top choice for 28% of Likely Republican Primary Voters. Rudy Giuliani, who has been the frontrunner for most of the year, is close behind with support from 21%. Former Massachusetts Governor Mitt Romney and Arizona Senator John McCain each attract 12% of the vote. Former Arkansas Governor Mike Huckabee remains atop the second tier at 6% . . . .
UPDATE: Other polls apparently put the race within the margin of error. At the Iowa State forum, Stewart said that having campus police trained and certified to carry guns would help officers protect students. He said ISU police deserve the same level of protection as officers in other communities. Warren Madden, ISU vice president of business and finance, said an armed police force could react more quickly to serious threats than other law enforcement agencies. "Sometimes time is a critical element in responding to events," Madden said. Herman Quirmbach, ISU associate professor of economics and a Democratic state senator from Ames, said arming campus police is not the answer to violence on campus. Rather, Quirmbach said, the university should identify students who may have violent tendencies and get them help. Faculty at University of Northern Iowa and Iowa State University opposed letting police carry guns. The faculty at the University of Iowa voted "12-3 to support arming police." Well, the debate is heating up and the University Presidents have made their decisions even if they haven't been made public yet. One would hope that an economist such as Quirmbach would understand the notion of deterrence. In any case, why does he think that they will be successful in identifying those who will commit the attack (assuming that it is only students who will do it)? What do you do if you fail to identify those who want to do the attack? Thanks to Richard Featherstone for sending this to me. With the Swiss People’s Party in the lead in Switzerland, some of the earlier concerns about Switzerland adopting much stronger gun control laws appears to have receded somewhat. Mexico's gun control laws are much stricter than in the United States. Individuals may purchase pistols or lighter caliber rifles, but only after obtaining a license following an exhaustive background check and then registering the firearm with the federal government. . . .
People in Mexico have a clear idea of what their country’s most pressing concern is, according to a poll by Ipsos-Bimsa published by El Universal. 21 per cent of respondents think crime is the biggest problem facing the Latin American country. . . . Gun control advocates claim that the problem is guns from the US. Here is my question: Why is it that if the Mexican's can't control the drug trade, they are going to be able to stop the drug gangs from getting the guns that are necessary to protect their drug businesses? A high school teacher wanting to carry a gun on campus is fueling a challenge against a Medford School District policy that prohibits possession of a weapon on school grounds. Portland-based lawyer Jim Leuenberger, with backing from the Oregon Firearms Federation, said in an e-mail sent Friday to the Mail Tribune that he intends to ask a Jackson County Circuit Court judge to declare the policy "illegal and void" for holders of concealed handgun licences. "There is a state statute that prohibits local governments — including school boards — from restricting possession of firearms by concealed firearm permit holders," Leuenberger said. "The state statute says any such local restrictions are void." . . .
On a day when most stocks nose-dived, gun manufacturer Smith & Wesson (nasdaq: SWHC - news - people ) shot up 5.09%, or $1.02, to $21.06 on Friday. On Thursday, the company reported record earnings of $74.4 million for the quarter ending July 31, and raised its guidance for the remainder of the 2007 fiscal year. Analysts attributed the gun maker's recent success to its product line expansion. “Smith & Wesson has done a phenomenal job moving beyond the handgun market to include long guns like rifles,” said Eric Wold of Merriman Curhan Ford & Co. . . .